"Game of Thrones" Cast Plays "Game of Unknowns"
Winter has been here for a while and it's stressing us out. How many of you have sat for the entire 50 to 70-minute duration of a Game of Thrones episode, your eyes glued to the screen, ready to "SHHHHH!" anyone near you (siblings, parents, significant others, non-significant others, children, pets, the pizza delivery person you're already angry at for being late) who dare make a peep while the show is on? And this shorted, but spectacular season of Game of Thrones is especially stressful. So chill out for a bit and check out what your faves do for fun—with each other—when the cameras are off. Jon Snow Is a Dragon: On a recent episode, Kit Harington's character shared a moment with Drogon, Daenerys Targaryen's enormous and terrifying dragon-child and loyal steed. 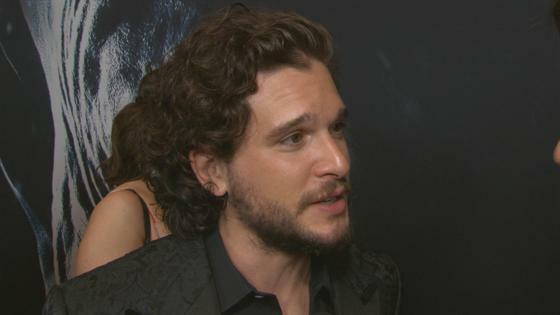 Emilia Clark, who plays the Mother of Dragons, posted on her Instagram page behind the scenes images of the two, including a hilarious video of Kit pretending to be a dragon. Because of course! Feud? What Feud? Things got rather tense between Arya and Sansa Stark in the penultimate episode this season. It must have been quite challenging to film such a scene, because in real life, Maisie Williams and Sophie Turner are besties. On the day of the finale, Turner posted on her Instagram page a photo of the two in costume doing some, er, interesting stage moves. Crotch grab, anyone? "In honor of the Thrones finale out tomorrow night, and of 6 mill followers on instaaaa... here's da reel roadmans of westeros," she wrote. Motley Crew: Also last week, Turner and other cast members, some of whom have never interacted onscreen, were having a great time when the cameras were off, as seen in a photo posted by Carice van Houten, aka the Red Woman. Tormund Is an International Treasure: But we bend the knee to the king of all behind-the-scenes Game of Thrones antics—fan-favorite, red-headed, spectacularly bearded Norweigian star Kristofer Hivju, who plays Tormund Giantsbane the Wildling. On the recent season, his character and The Hound form a beautiful new friendship. Last week, he shared a hilarious video of the actor who plays him, Rory McCann, serenading him on from a trailer on the Game of Thrones set with an acoustic version of the '50s folk song "Yellow Bird." Naturally, he joins in. A day later, he shared a behind-the-scenes promo video you may not be able to unsee, using Facebook's new tool to morph into the Night King. In July, he posted what we hope is a spoiler video, showing him narrating a well-produced HBO Nordic clip of his and character Brienne of Tarth's figurines. Game of Thrones' season seven finale airs Sunday at 9 p.m. on HBO.